Measuring less than one cm in length, the Brazilian Gold frog also known as “Saddleback toad” or “Brachycephalus sp.” are some of the smallest frogs endemic to South East Brazil’s Atlantic rainforest. They are found at very high altitude, where they are adapted to low temperature and high humidity. As a result, the populations are isolated and form technically “sky” islands on mountain tops. Over 16 species have been described. As one can see from the photo, these amphibians have three toes on each foot, and two fingers on each hand, in contrast to the usual five digits of most frogs. 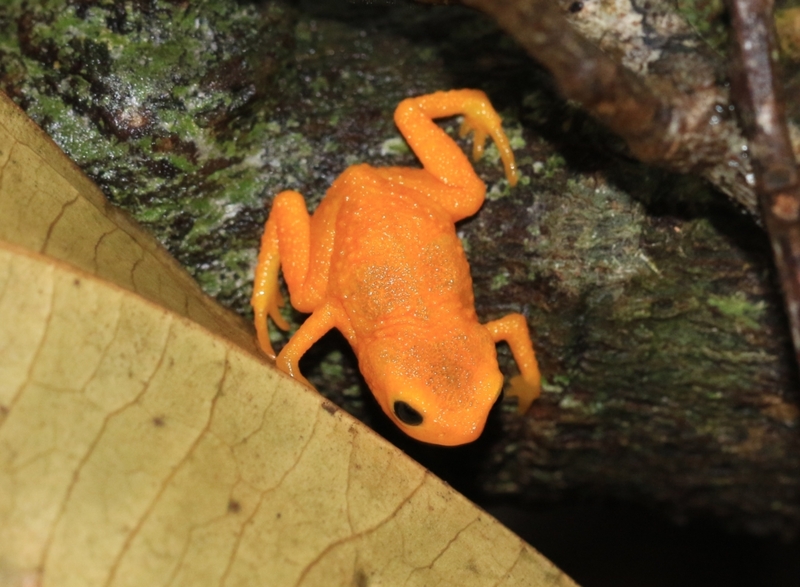 Whilst climbing in search of orchids in the recently purchased Lagoinha area with Helmut Seehawer last December, we came across a large number of these golden frogs in leaf litter. On taking a photograph, one gave an enormous silent roar in protest and then leapt away a massive distance by our standards to safety. We left them to their lives in this isolated world. Our thanks to Rainforest Trust who provided funding to purchase this land. It is located at around 1000m above sea level and nestles next to Lagoinha farm. IUCN states that species here at REGUA are of “least concern” and very well protected from deforestation, but we hope that climate change and pollution won’t affect them adversely. 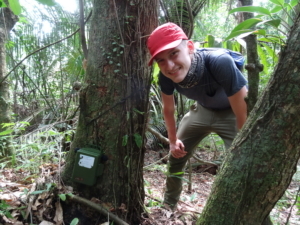 Masters student Hidde de Graff enrolled at University of Amsterdam has come to stay for three months at REGUA studying amphibians. Professor Wouter Halfwerk organised Hidde’s stay here with Brazilian Dr. Mauricio Almeida and he has been conscientiously at work in the field. Hidde is been analysing sound tracks from deliberately located microphones recording night sounds in forest fragments as a way to detect and identify the amphibian species present. Every quarter of an hour those frogs calling will be recorded and later as he studies the sonograms, he will be able to identify the species present. Dr Mauricio carried out a similar survey a few years ago and Hidde will be able to compare the results and see if there has been any species change and evaluate how accurate his findings are in terms of species identification. The Atlantic Rainforest at REGUA is well protected and expanding, and one of the prime habitat quality indicator species are amphibians. Are the populations stable or declining? Researchers are always interested as their population numbers reflect air quality and air humidity levels, which in turn are affected by forest cover. There are over seventy amphibian species at REGUA and with programmes in forest protection and expansion, all species appear to be in good shape. One genus that attracts attention is the Atlantic rainforest endemic Horned frog which we found on the green trail recently. 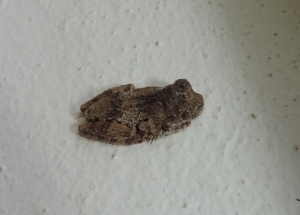 Both Proceratophrys appendiculata (also known as Guenther’s Horned Frog) and Proceratophrys boiei were seen. 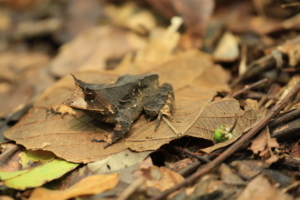 They live in the leaf litter in forests up to an altitude of around 1200m, and spawn in forest streams. Both species are relatively common at REGUA and all visitors like to pick them up and get a closer look at them. They sit immobile and looking rather glum, patiently waiting to be returned to the ground when they hop off into the leaf litter and are quickly almost impossible to refind. Walking the 50km of trails at REGUA is fascinating for birders and naturalists alike. Altitudinal range spans 30 – 2000m and there is a richness of invertebrates and plants to match the diversity of birds that draws the majority of visitors to REGUA. All classes of arthropod are present in abundance and there are many interesting patterns of distribution waiting to be identified and investigated. REGUA’s lodge garden has a roofed, whitewashed wall complete with mercury vapour lamp generating many new records of moths for the Reserve and for Rio State. 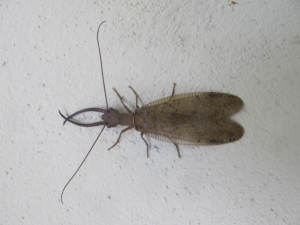 The wall often reveals a wealth of other interesting invertebrates such as this Dobsonfly (Corydalidae). Many of these creatures are difficult to see in the forest probably because they are residents of the tree canopy. In the forest there are chance encounters with exciting species such as the White Witch Moth (Thysania agripina) Noctuidae with a huge wingspan. December to Febuary is the Brazilian summer and usually a hot rainy season and time of maximum plant growth. This is, of course, an excellent time for all insects and amphibians. Whilst August to November is the Brazilian Spring and busy for birdwatching, it is also good for insects. Only March to July are a little quieter. There is a profusion of wonderful butterflies. Some, like the 88, (Diaethria clymena) are very common. The most famous neotropical butterflies belong to the Genus Heliconia, with their distinctive strap-shaped wings and bright colours. These insects were shown to have co-evolved with their food plant, the different species of passion-vine (Passiflora). The vines put out new shoots irregularly and the butterflies must live a long time to be able to search out new growth and lay a full complement of eggs. Another spectacular group of insect are the various species of huge Morpho butterflies which flit through the forest under-storey. Diptera are interesting and diverse. There are three common sources of food that can provide for a profusion of flies: dung, carrion and some species of freshly emerged fungus. Parasitoid ichneumonids and tachinids search out the larvae of butterflies and moths whose living tissues they will feed on until they finally cause their death. Ants are predators, roaming leaf and shoot for opportunities or different species will farm leaves with the help of fungus. Spiders must guard against predatory wasps and some of these are very large indeed. oss the forest as another giant tree succumbs to their tiny jaws. There is much work to do to find out how many species of arthropod exist in these rich habitats. 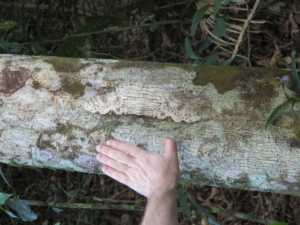 We are only in the earliest of stages investigating how all these myriad species interact in Mata Atlântica. With the effects of El Niño, the weather here at REGUA has been very humid with much rain received over the last three months. It has been great for the trees which are growing rapidly . 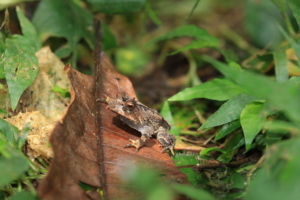 The amphibians at REGUA have also loved the heat and humidity. This tiny tree frog found in forests is an example of Dendropsophus seniculus, of the Hylidae family, a fairly common species found in the lowlands of the mid-Atlantic Rainforest ranging from Bahia to Sao Paulo. Though IUCN’s Red list considers them “least concern” the loss of their habitat has affected population numbers and these amphibians are very important in the control of insects, especially mosquitoes and we are very happy to find some many species at REGUA. Their presence certainly shows that the habitat REGUA has restored is working very well.